The man of the house finally returned home after a long year! The lady of the house finally been able to fight directly instead of fighting over call / Skype! The baby of the house decided to chant “Narod Narod” at that point. She played the role of positive catalyst to spice up the fight! You may wonder what’s then! Well, the apartment turned into a home after a long time 🙂 and then the husbandman requested for a comfort meal which according to him he was missing while he was in Saudi! 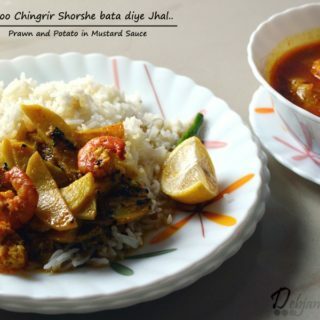 I then decided to cook a simple Bong meal consisting of typical bong “Macher Jhal” (Aloo Chingrir Shorshe bata diye Jhal in this case) along with rice. I finally ended on cooking a runny curry with Prawn and Potatoes to accommodate with the Garam Bhat! As I am still in the recovery phase as I had slip disk and recommended by my dearest Orthopedic to not to move for an entire month and I naturally skipped cooking as much as possible. Even now I am trying to go with the fuss-free cooking as much as possible and mostly opting for the comfort dishes. 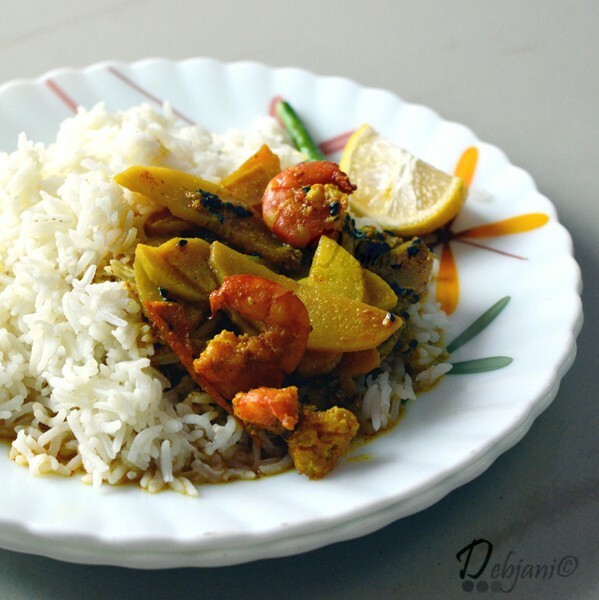 When it comes to the comfort food and specifically something true, blue Bengali my Bong soul can’t resist but to cook the dishes which I have had several times while growing up in my north Kolkata household. The dish I made for lunch a few days back is none other than a simple yet light Mustard based curry of Prawn and Potato; Aloo Chingrir Shorshe bata diye Jhal it is. 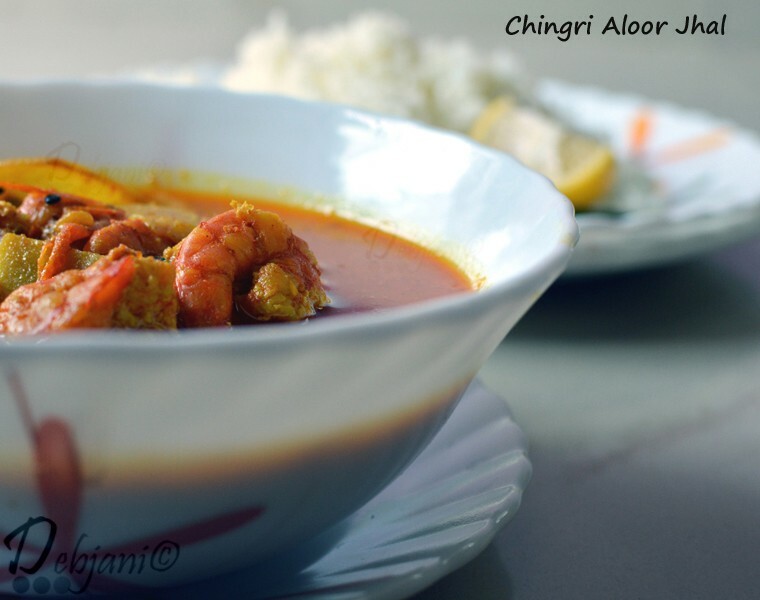 This particular dish what we call Aloo Chingrir Jhal as well is a family favorite. We used to have it at least twice or even thrice a month at my ancestral house. Mamoni (Aunt) was probably the best cook who used to make it for the entire Chatterjee clan. 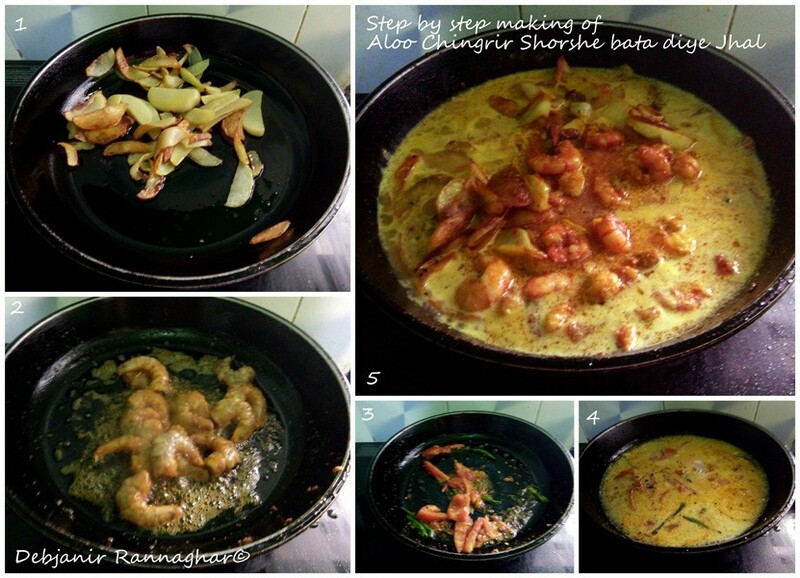 The recipe calls for some basic ingredients apart from either medium size Prawn or Shrimp and Potato. 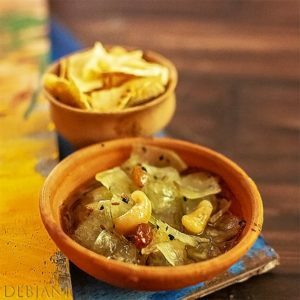 I still remember cherishing a bowl full of Aloo Chingrir Shorshe bata diye Jhal along with hot steamed rice prepared by Mamoni while having my hurried lunch during my university days and even before while growing up! Those days, we were not offered with fancy food every now and then in our big fat joint family but when it came to the taste of food nothing could match those simple of the simplest dishes prepared by my mother and aunts in our well managed joint family. The number of Prawns per person was substituted by the runniness of the curry. The use of potato was to accommodate a family of 15 people with 500 g Prawns! I tried to learn as much as from them and I try to recreate those quite often in my kitchen not only to cherish the traditional bong dishes but to cherish the beautiful memory of my childhood. 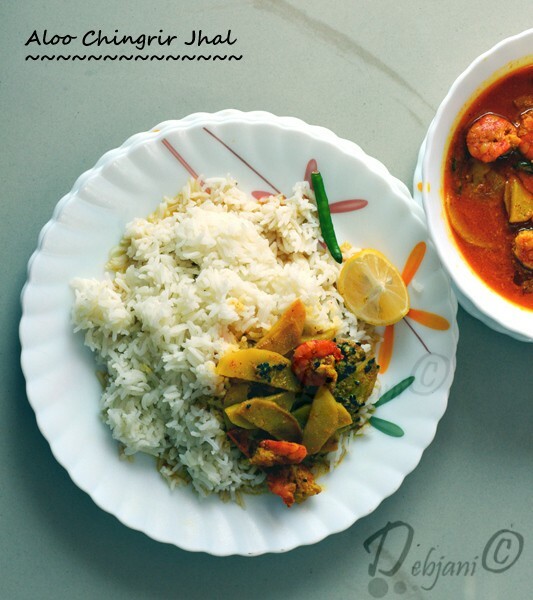 To make Aloo Chingrir Shorshe bata diye Jhal, I prefer to use de-shelled Prawn or Shrimp and that is the reason I used to opt for Frozen Shrimp when we were in Gurgaon. In Kolkata, however, availability of fresh prawn is quite good in the local market and I naturally opted for the fresh one. The curry is mustard based and hence either Mustard paste or Mustard Powder can be used though I prefer to use fresh Mustard paste. Aloo Chingrir Shorshe bata diye Jhal goes perfectly with hot steamed rice. Nigella Seed/ Kalojire: 1 Tsp. Make a paste of Mustard Seed by adding little salt and water. Now mix a cup full of water with the Mustard Paste and using a strainer strain the liquid to discard the husk. Keep it aside. Peel Potatoes and cut into medium thick wedges and rub some turmeric Powder. Chop Tomatoes and slit green chilies. Wash and clean Prawns and de-shell and de-vein those. Rub clean Prawns with some Turmeric Powder and Salt and leave for 10 minutes. Heat Oil in a Pan and fry Potatoes in medium flame till potatoes soften. Strain fried potatoes from oil and keep fried potatoes aside. In the remaining oil fry Prawns in medium flame and remove from the oil. Now temper remaining oil with Nigella seed. Add chopped tomato and slit green chili to the tempering and cook for 2-3 minutes in medium flame till tomato softens. Now add Mustard paste to the tempering along with Turmeric Powder, Red Chili Powder, and Salt. Add 2 Cup water and bring it to boil. Cook for around 6-7 minutes in low flame. Add water in between to adjust the level of curry. Aloo Chingrir Shorshe bata diye Jhal is typically served with the curry on the thinner side. However, you may adjust the level based on your preference. Drizzle some Mustard Oil before removing the curry from heat. 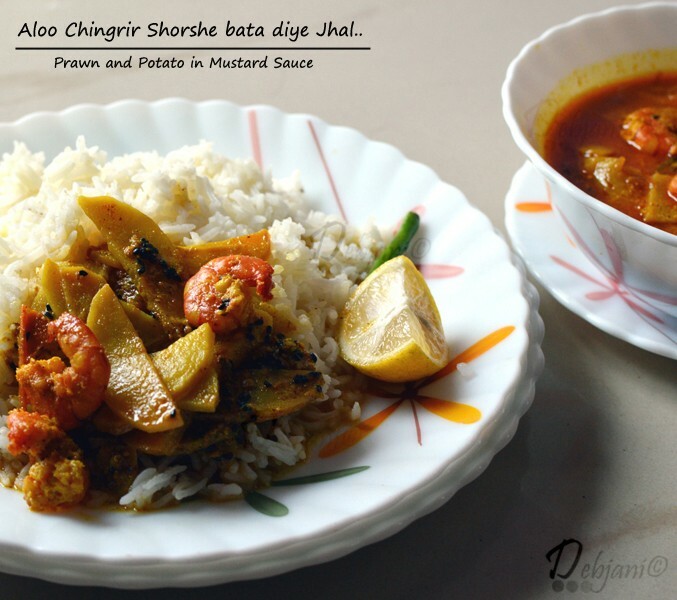 Serve Aloo Chingrir Shorshe bata diye Jhal with hot steamed rice. Use either a “ShilNora” (Shil Batta) or grinding jar of the food processor to make the mustard paste. Do try the Rajasthani Kadhi Pakoda or the Cabbage Poriyal or the Bhetki Maacher Aloo Phulkopi diye Kalia from my blog for a dose of comfort!